Where is Armenia? What is Armenia? Greater Armenia is an upland country that forms the headwaters of the Tigris and Euphrates rivers. It was the first country to be converted to Christianity and still proudly maintain its Christian heritage. Today however much of Greater Armenia lies in Turkey, and modern Armenia is but a shadow of its former self. Mount Ararat, seen above, should be at the heart of Armenia, but today it lies just across the border, in Turkey. But where was greater Armenia? In June 2013 we went to Armenia to explore this wonderful country and see something of its archaeological heritage. Modern Armenia contains many crucial monuments of the Armenian past, and here we present an introduction to the history and archaeology of the Armenian heritage. We begin by looking at modern Armenia and particularly the capital Yerevan. Yerevan was one of the show cities of the Soviet Union, indeed perhaps the greatest of all Soviet cities, built and designed by one of the world’s great architects, Alexander Tamarian.We then turn to archaeology, and begin with Shengavit, and the Proto-urban cultures of the early Bronze Age and see how the cities that began in Mesopotamia stretched up into the highland regions of Armenia.Then the middle Bronze Age sees influence from the north, with the introduction of kurgan or barrow burials of a type common on the steppes of central Asia, sometimes covering horse-drawn waggons or chariots. We look in particular at Lchashen, where numerous waggons have been discovered, and at Metsamor, which grew rich on the copper that was quarried and smelted there, and on the magic rock nearby that is covered with mysterious rock carvings. And then we look at the Uratu, a powerful kingdom that from the 9th to the 7th century BC vied with Assyria for the leadership of the headwaters of the Tigris and the Euphrates. And finally we look briefly at Christian Armenia. Armenia was the first country to embrace Christianity, a full decade before Constantine the Great accepted Christianity in the Roman Empire, and there is a rich heritage of the very distinctive Armenian type of church and monastery. 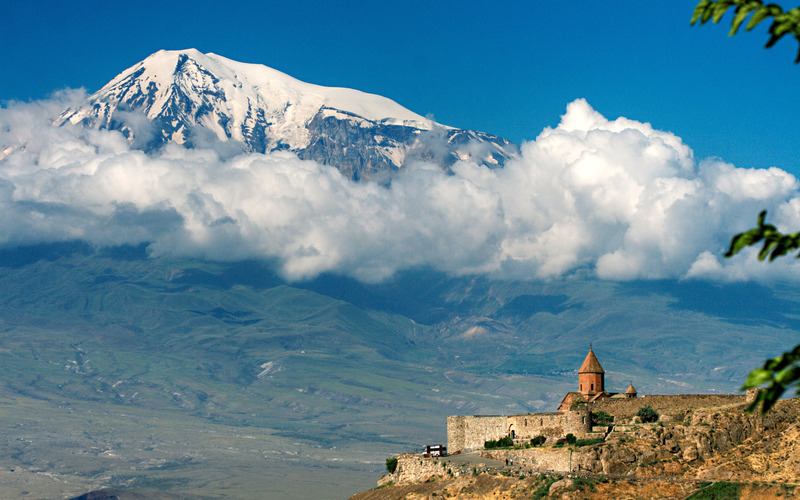 (This photo of Mount Ararat is not mine – I never saw Mount Ararat, it was always in the clouds when I was there. But this splendid photo is taken from Wikipedia, and is by Andrew Behesnilian.